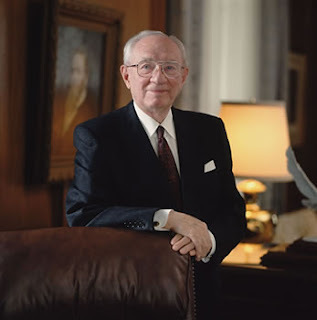 I'm sad and shocked at the news of the passing of our dear prophet, President Gordon B. Hinckley. But I'm so thrilled that he is with his wife again. He will always be the prophet of my youth, the prophet of my mission, the prophet of my newlywed life, and the prophet who's words guided, uplifted, and strengthened me through some very difficult times. What an honorable man. I will always remember the opportunity I had to sing for him in the church office building. He carried with him such an overwhelming spirit of peace and love. He gave each member of my performing group a small evergreen branch and asked us to plant it. I named mine Gordy, after him, and planted it outside my apartment building. My plan has always been to take my children back to that apartment building one day and show them the little branch that grew into a tree. Although I have no idea if the little blue spruce has survived and thrived, I know that the seeds of faith and hope that were planted in me through President Hinckley's talks, are alive today. I loved his sense of humor and ability to keep our attention. I loved seeing him on my mission as he broke ground for the Nauvoo temple. I loved seeing him on CNN with Larry King for the first time when I was living in New York City and feeling so lost and alone. It was like seeing an old friend. What a wonderful leader of the Church of Jesus Christ of Latter Day Saints! I will miss him greatly. Thankyou for this. I am sad for me and the world and happy for him and his sweetie. I joined the church when President Kimball was the prophet ...and though very loyal to President Kimball, it wasn't long till President Hinkley had my heart. Amazing, Loving, upbeat, FOCUSSEd and driven to accomplish so much with a smile and hard work. Truly amazing.